Some folks on the right in Washington, generally known as reformicons (short for reform conservatives), want the Republican Party to de-emphasize marginal tax rate reductions and instead focus on providing tax relief to parents. There are many leaders in this movement and, if you want to learn more about the tax proposals being discussed, I specifically recommend the writings of Robert Stein, James Capretta, James Pethokoukis, Ramesh Ponnuru, Yuval Levin, Charles Blahous, Jason Fichtner, and Reihan Salam (and I’m sure I’m unintentionally leaving off many other worthy contributions). I explained last year what I like (and don’t like) about reform conservatism, but I haven’t specifically analyzed the tax agenda of the reformicons. Time to rectify that oversight. The Wall Street Journal was kind enough to give me some space so I could share my thoughts on this topic. I start by outlining the debate, albeit in simplified form because of space constraints. There’s a policy debate among conservatives in Washington about the best way to cut taxes and reform the tax code. The supply-siders want to replicate the success of Reaganomics with lower marginal tax rates. But there’s also a camp who call themselves “reform conservatives” who want income tax credits or payroll tax cuts explicitly for the purpose of reducing tax liabilities for middle-class parents. The supply-siders argue that if you want to encourage more work, saving, investment and entrepreneurship, then it is a good idea to reduce marginal tax rates on productive behavior. …Those in the other camp…don’t necessarily disagree with the supply-siders. They note that it was important to lower marginal tax rates in 1980 when the top personal tax rate was a confiscatory 70%. But now that the top rate is “only” about 40%, they argue, lower tax rates won’t deliver nearly as much bang for the buck. The reformicons are right. Dropping the top tax rate from 40 percent will help the economy, but the pro-growth effect won’t be enormous. At least not compared to what happened during the Reagan years when the top tax rate was slashed from 70 percent to 28 percent. 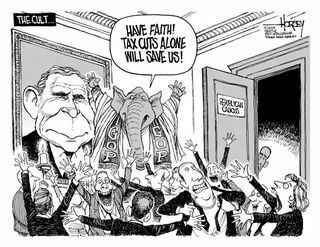 And, as this leftist cartoon suggests, many Republicans act as if across-the-board tax rate reductions are an elixir for every ill. But can reformicons suggest a better way of cutting and/or reforming taxes? I’m not convinced that their agenda of child-oriented tax relief is the right answer. In my column, I note that many of their policies have already been implemented, yet there’s little if any evidence that these tax cuts have generated positive outcomes. …reform conservatives say it’s time for new ideas. That’s a nice concept, but Republicans already have enacted many of their proposed policies. The child tax credit was adopted in the 1990s and expanded during the Bush years. The earned income credit also funnels a lot of money (in the form of tax relief or cash payments) to families with children, and that provision also has been significantly expanded over the years. These policies have worked, at least in the sense that households with children now face lower tax liabilities. There is little evidence, though, to suggest positive economic or social outcomes. Were families strengthened? 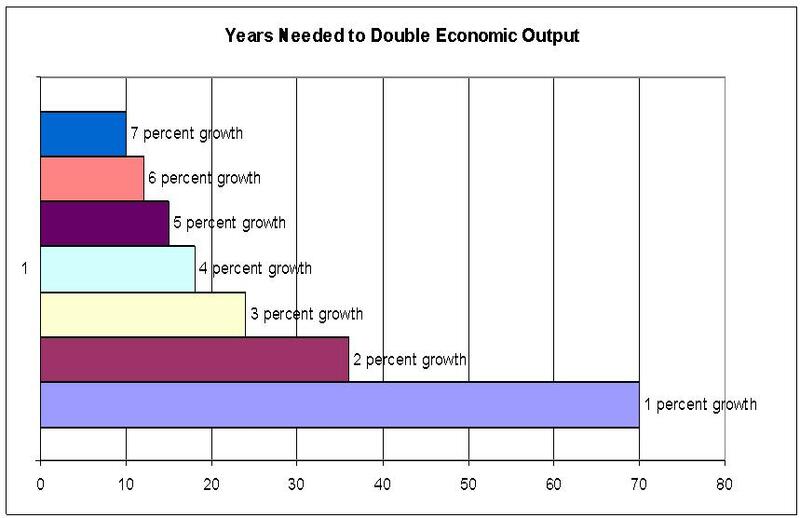 Did the economy grow faster? Did middle-income households feel more secure? The reformicons often argue that their tax proposals are politically more appealing. That may be true, but that doesn’t mean they are political winners, particularly if reformicons are trying to appease the class-warfare left, which will simply argue that tax cuts targeted at families making less than, say, $100,000 will be even “fairer” if they are targeted at families making less than $50,000. Or maybe targeted at households who pay no tax, which means more transfer spending through the tax code! The tax-credit reformers also argue that their proposals are much less susceptible to class-warfare demagoguery that is the supply-side approach, since tax relief flows to lower- and middle-income voters. …But here’s the downside: Conservatives can bend over backward to appease the class-warfare crowd, but they can never outflank them. …Once conservatives have accepted the left’s premise that tax policy should be based on static distribution tables, they won’t have a ready answer for the left’s gambit. But as far as I’m concerned, the real issue is how to raise take-home pay. The reformicons want to make families more secure by reducing how much the IRS takes from their paychecks. I certainly like the idea of boosting post-tax income, but I contend that it would be even better to focus on policies that increase pre-tax income. In other words, our economy is under-performing and that is the greatest threat to the financial security of families. Folks on the left say it is the fault of “secular stagnation” and that the burden of government should be further expanded, but both reformicons and supply-siders agree that we’ll get far better results by focusing on tax cuts. I end my column with some glass-half-full analysis. The reformicons may not be thrilled by lower income tax rates and the supply-siders may not be excited by child-oriented tax cuts, but both camps are quite sympathetic to tax reforms that address the punitive double taxation of income that is saved and invested. While the camps disagree on lower individual income tax rates vs. child-oriented tax relief, both agree that the tax code’s bias against capital formation is very misguided. The logical compromise might be to focus on reforms that boost saving and investment, such as lowering the corporate tax rate, reducing the double taxation of dividends and capital gains, and allowing immediate expensing of business investment. These reforms would have strong supply-side effects. And since more saving and investment will lead to increased productivity, workers will enjoy higher wages, including households with children. To be sure, some critics will say this type of tax agenda is too “business friendly,” which is an indirect way of saying that average voters may not understand how they benefit from tax reforms that don’t have a big and fast impact on their paychecks. So maybe the right answer is to rip up the entire tax code and replace it with a simple and fair flat tax. Dan, as always, you have made WAY too much sense! Please discontinue your economically sound rhetoric immediately! The last thing we need is more complexity added to the tax code, to appeal to a specific interest group. Even if you could find “good” tax ideas that have no unintended consequences (there are none); when you put them all together, complexity becomes the problem. In addition, complexity shields really bad ideas from exposure. If starting from scratch, no one would have a tax code (and supporting documents) that exceeds 74,000 pages. So let’s start from scratch with a true flat tax. BUT, we can’t. We are not starting from scratch. Somehow, the effective tax rate must be higher for higher incomes, or it will not be politically acceptable to the bottom 95%. You can cap the highest marginal rate with a flat tax but to get a flat tax passed, you must add either standard deduction or some form of modified prebate. Obviously, the flat tax rate must be higher the more liberal the effective rate adjustment. Implementing a flat tax will require that a balance be found between the maximum flat rate and politically acceptable effective tax rates. A simple and fair tax (such as a federal consumption tax) is the right approach, as Dan Mitchell’s analysis clearly points out. One part of the equation that many tax reformers miss is the fact that traditional families are only a fraction of the middle class. Much of the middle class is comprised of single households, empty-nesters, and adult children living with parents, on which child-based tax credits have no effect. In fact, a few years back the number of households with pets surpassed those with children. A flat or fair tax is the only equitable way to reform tax policy.